^ Is this what you want the Oregon coast to look like in the future? Following the theme of sacrificing the public’s favorite natural areas for the benefit of oil and gas companies, the Trump administration has just announced plans to expand offshore drilling in the Pacific, Atlantic, Gulf of Mexico, and Arctic Ocean. This drastic proposal puts our nation’s coastal communities, beaches, surf breaks, and marine ecosystems at risk of a catastrophic oil spill. Comments are due March 9, 2018. Unsure of how to do that or what to say? We’ve got you covered! Read our blog about submitting comments. Tell your friends to sign it, too! Share the photo to social media or email it to oregon@surfrider.org (click below for download). 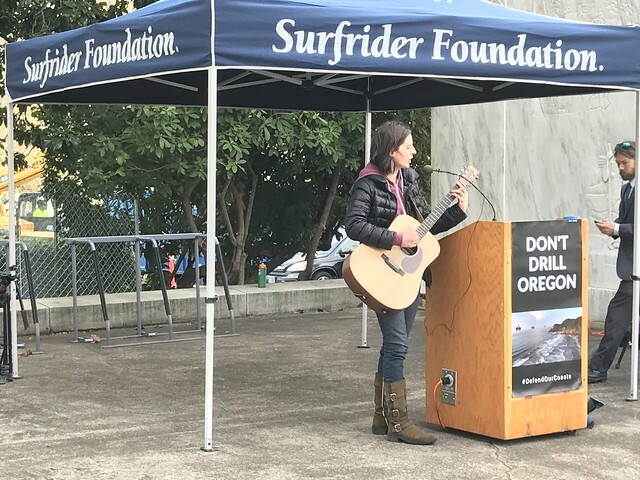 Our Rally against Offshore Oil Drilling in Salem on February 6th was a success! Thank you to the 300 supporters who took off work to join the rally and attend the Bureau of Ocean Energy Management meeting to submit public comments. Check out the full story here and be sure to check out the photos below.